School football powerhouse, St Patrick's College has continued its unprecedented era of triumph by claiming victory in the 2015 Herald Sun Shield. The 29-point victory over Essendon Keilor College at the Port Melbourne Oval on Saturday, August 8 represented the sixth consecutive title for the boys in the green, white and blue. The previous best streak of grand final wins was achieved by Assumption College which won four titles in the 1980s. The full match report from the 2015 premiership decider can be seen here. St Patrick’s College has made it nine straight Ballarat Associated Schools championships after beating Ballarat Clarendon College by 39 points at Lake Wendouree Reserve. The St Patrick's College 1st XVIII has won its fifth straight Herald-Sun Shield Grand Final with a comprehensive win over Box Hill Secondary College at the MCG on Friday, August 8. It is the first time in history any school has won the state's most prestigious school football competition five years in a row and cements St Patrick's College's reputation as one of the elite footballing schools in Australia. Best Players: Tom Templeton, Liam Duggan, Jacob Hopper, Leigh Spiteri, Dan Butler, Brenton Payne, Ben Simpson. For full match report, written by Year 11 student Xavier Carey, click here. In February 2014, St Patrick's College held a dinner to announce its greatest football team from its 120-year history. 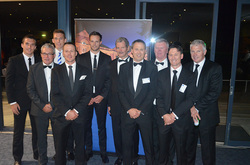 More than 170 people attended the black-tie fund raising dinner to witness the announcement of the team which features many of the great names in the history of the AFL. To see who made the final team please click on this link.